Eyewitnesss Identification Seven eyewitnesses (Andrews, Tracy, Heron, Pelser, Splaine, Devlin, and Goodridge) placed Sacco in or near Braintree around the time of crime. A few other witnesses testified that Sacco resembled one of the bandits, but declined to make a positive identification. None of the seven eyewitnesses was at all times certain of his or her identification. Andrews and Pelser had told a defense investigator that they could not make an identification. Splaine and Devlin only briefly saw a man leaning out of automobile from a distance of over 70 feet. None of the witnesses identified Sacco until well after his arrest. The witnesses were not required to pick Sacco out a line-up. Several of the closest witnesses to the crime were not able to identify Sacco. (1) Before the Lowell Committee, the police chief of South Braintree expressed surprise that the eyewitnesses seemed much more certain of their indentifications in the trial than they did at the preliminary hearing a year earlier. (2) Years after the trial, an Italian workman said he saw Sacco among the bandits, but he chose not to come forward and testify. 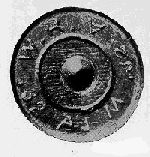 One of the recovered bullets could not have been fired from Sacco's Colt automatic. It clearly was fired from someone's Colt. Ballistics expert Proctor testified that "Bullet 3" was "consistent with being fired through [Sacco's] pistol." Expert Van Amburgh noted a scratch on Bullet 3 likely made by a defect in the rifling of Sacco's pistol. Two defense experts (Burns, Fitzgerald) testified that "Bullet 3" could not have been fired from Sacco's Colt. (1) Jurors reported after the trial that they found the ballistics evidence compelling. (2)Prosecution expert Proctor told District Attorney Katzmann prior to trial that he did not believe that "Bullet 3" was fired from Sacco's gun. (3)In 1961, a ballistics test conducted at the Mass. Police Lab suggested that Sacco's Colt was used to fire "Bullet 3." Evidence Relating to Cap A cap with a hole in it picked up at the crime scene resembled one owned by Sacco. The hole might have been produced by a nail at Sacco's workplace on which he he was in the habit of hanging his cap. A witness (Kelley) testified that the cap resembled in color and style a cap owned by Sacco. Sacco denied ever owning the cap, or any cap with earlaps. Sacco tried on the cap before the jury and claimed that it did not fit (the prosecutor claimed that it did). It is not known for sure that the cap found at the scene belonged to one of the murderers, and not to one of the crowd who gathered soon after the crime. (1) A prosecution medical expert compared hairs found in the cap with some from Sacco's head, and found them to be identical, but the expert was not asked to testify. (2) In the Lowell Committee hearings it was revealed that the hole in the cap was made by Jeremiah Gallivan, the chief of police of Braintree. Evidence Relating to Car At the time of their arrest, Sacco and Vanzetti had just gone to the house of the owner of a car repair shop (Johnson) where a man (Boda) connected with a stolen Buick that was presumed to be the car used in the murder (it was found in the woods near Boda's residence two days after the crime) had taken an Overland to be repaired. Under a prearranged plan, the wife of the repairshop owner called police. Sacco and Vanzetti sudddenly left. The prosecution suggested that they left because they were suspicious of Mrs. Johnson's actions and feared being connected to the Braintree murders. Sacco and Vanzetti testified that the reason that they left Johnson's home without picking up Boda's car was that they discovered that the car did not have 1920 license plates. Neither Judge Thayer nor the Lowell Committee found the prosecution evidence relating to Boda's Overland to be especially compelling. Absence from Work Sacco was absent from his job at the 3-K shoe factory on the day of the crime. The consulate clerk in Boston, who Sacco said he visited, could not remember him (although this is not surprising, since the clerk sees several hundred persons per day.) Sacco claimed to have been in Boston trying to get a passport from the Italian consulate on the day of the crime. After visiting the consulate, he said, he ate at Boni's Restaurant in Boston. Seven witnesses testified that they saw Sacco at the restaurant. (1) When first asked about his whereabouts on April 15, Sacco did not say he was in Boston. (2) Thirty years after the trial, one of the witnesses (Ramuglia) who said he saw Sacco at the Boston restaurant admitted that he perjured himself for Sacco at the request of a Boston anarchist group. Actions and Falsehoods Suggesting Consciousness of Guilt After his arrest, Sacco told lies about his recent whereabouts, denied knowing Boda, and denied holding anarchist or radical beliefs. His explanation for carrying a gun at the time of his arrest was implausible. The prosecution suggested that these lies showed consciousness of guilt. Sacco testified that his lies during his initial police interview were because he feared that if he told the truth about his radical beliefs or admitted knowing radical friends, he would likely be deported. The Lowell Committee determined that Sacco's lies were consistent with his explanation of being afraid of deportation. Eyewitness Identification Four witnesses (Faulkner, Dolbeare, Levangie, and Reed) placed Vanzetti near the crime scene. Faulkner said he saw Vanzetti get off a train at East Braintree at ten o'clock. Dolbeare claimed to have seen him in the back of a car near South Braintree Square between ten and twelve. Levangie claimed to have seen him driving a car near the South Braintree station soon after he heard shots fired. Reed, a gate-tender, testified that he saw Vanzetti get out of the passenger-side of the front seat of a car at a crossing near Bridgewater around 4:15. No one claimed to have seen Vanzetti during the actual shooting. A defense witness testifed that Levangie said a few minutes after the shooting that it would be hard to identify the man he had seen driving the car. Another witness testified that Levangie told him that he saw no one, while a third witness said Levangie initially said the driver was light-haired (Vanzetti is dark-haired). Vanzetti testified that he was selling fish in Plymouth (25 miles from Braintree) at the time of the crime. Six witnesses testify that they saw Vanzetti in Plymouth near the time of the crime. Although the eyewitness evidence placing Vanzetti at the crime scene was weaker than that placing Sacco at the crime, the Lowell Committee thought that Vanzetti's alibi witnesses were weaker than those for Sacco because several were friends of Vanzetti and they had no special reason to connect their dealings with Vanzetti with the day of April 15. Vanzetti's gun The gun found on Vanzetti at the time of his arrest (a 38 calibre Harrington & Richardson revolver) resembled one that paymaster guard Berardelli was thought to be carrying at the time he was shot. Vanzetti's gun had a repaired hammer, and there was evidence presented that Berardelli's revolver also had a repaired hammer. At the time of his arrest, Vanzetti said he bought the gun at a store (but could not remember which one) and he lied about how much he paid for the gun and where the bullets came from. Vanzetti testified that he bought the gun from a friend (Falzini) a few months before his arrest. He said he bought it because he received cash from his fish peddling business and was concerned about recent hold-ups. Falzini testified that he sold the gun to Vanzetti. (1) Vanzetti never explained why he felt it necessary to lie about the gun's origin when he was arrested. (2) Reports released in 1977 indicated that Berardelli's revolver was .32 caliber, not .38 like the one found in Vanzetti's possession. Actions and Falsehoods Suggesting Consciousness of Guilt Vanzetti lied about his guns, the whereabouts of his friends, and his reason for being in Bridgewater on May 5 [see also Sacco evidence above]. Vanzetti's explanation for being in Bridgewater at the time of his arrest was weak. Vanzetti probably went to Bridgewater to get Boda's car (the Overland) to commit another robbery. Vanzetti testified that he told some lies when initially questioned because the country was in the grip of the Red Scare, and he feared for his own safety and that of his anarchist comrades. Vanzetti stuck with his original story about why he was in Bridgewater: he testified that he had gone there to collect anarchist literature, but could not name the names or addresses of people or places he would be collecting the literature from. After Sacco and Vanzetti's execution, defense attorney Moore revealed that Sacco and Vanzetti had probably gone to Bridgewater to get Boda's car so that they could use it to collect dynamite from comrades who had hidden it. They thought this explanation was too damaging, and they stuck with their unlikely story. Additional notes on the Sacco & Vanzetti case: By any reckoning, the case against Vanzetti was considerably weaker than the case against Sacco. Even the prosecution may have had some doubts about Vanzetti's guilt: the assistant prosecutor wept when the jury pronounced Vanzetti "guilty." Sacco seemed to many observers more incensed about Vanzetti's conviction than his own and Vanzetti--unlike Sacco--continued to passionately proclaim his innocence right up to his execution. In 1943, Carlo Tresca, perhaps the best-connected anarchist leader of the time (and the man originally chosen to be Sacco's and Vanzetti's defense lawyer) said: "Sacco was guilty, but Vanzetti was not." In November 1982, Francis Russell (author of highly-regarded book on the Sacco-Vanzetti trial) was informed in a letter from the son of Giovanni Gamberi, one of four members of a group formed in 1920 to arrange the Sacco-Vanzetti defense, that "Sacco was guilty" and "Vanzetti innocent as far as the actual participation in the killing."